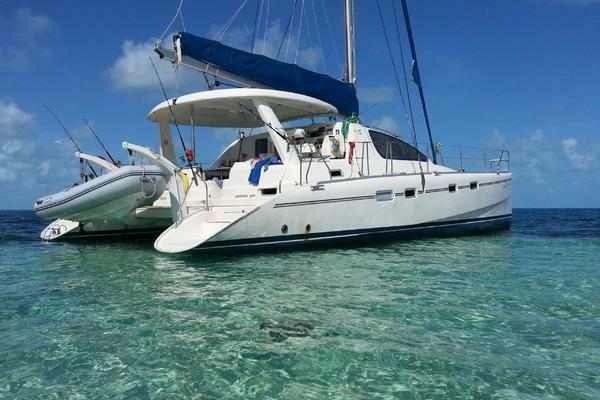 Perfect for a family or charter business! The beautiful interior is first class with laminate teak flooring, fine upholstery, corian counters and luxurious accomodations. Offering four queen staterooms each with a private head, fully equipped galley up that can can accommodate numerous cooks and a spacious comfortable salon that can seat 10. There is room for all your guests to relax and enjoy themselves. The exterior is equally well designed offering an easy flow of traffic from the huge cockpit to the wide walkarounds and foredeck or aft platform. Whether you are dining alfresco at the wrap around cockpit table, reclining on the cushioned bench seating, enjoying the foredeck trampolines and "dolphin seats" or swimming off the large aft deck and swim steps, you will always find a comfortable place to enjoy the sun or the shade. From a handling standpoint, the raised double helm seat offers excellent visibility with all controls in easy reach. Roller furling genoa and Fully battened Main in a stack pack main offer simplicity of handling. It is extremely easy access to board at the stern swim platform or twin molded stairs. There is a locker to stow snorkeling gear and cockpit shower. Fully outfitted and ready to sail! Her striking blue hull and bow flame decal will turn heads at every dock. Come see her today at Harbortown Marina in Fort Pierce! A combination of Beachwood trim, corian counters, rich upholstery and light interior is welcoming and luxurious. Beginning at the double opening doors you enter a large U shaped salon/dinette with seating for 10. The settee has an expandable table and also converts to a double berth. The nav station just to the right of the doors. The generous galley up is to port. Step down to each hull for two staterooms on each side. All the 4 staterooms offer queen size berths, upholstered bench, opening hatch and plenty of storage. Each private stateroom also has an en-suite head with shower. There is good ventilation with plenty of hatches and ports or sleep in air conditioned comfort. This is a galley everyone will enjoy! Be part of the conversation in the salon, room for several cooks and plenty of workspace on the corian countertops. Huge top loading refrigerator/freezer and a front loading refrigerator. Engine access from both stern opening hatches and under beds in aft staterooms. Roller furling genoa and stackpack main offers ease of handling. The traveler is on top of the arch. Excellent visability and handling options at the raised double helm seat. You will practically live in this generous cockpit! Plenty of room to recline and dine or grab a good book and relax in shaded comfort. Dual helm set and comfortable seating while under way. You will enjoy the easy access on and off your dingy or swimming from the stern. There's still more room up front with bow seats to watch the dolphins or trampolines to sun bathe.